Spray Banixx liberally to your horse’s ringworm and..the immediate surrounding area, you may do this two times daily for several days, or, as needed. The reason for spraying surrounding areas is due to the highly contagious nature of the infection. If possible or practical, pat Banixx gently into the skin of your horse or pony so that it makes firm contact. Be sure to wear disposable gloves and discard between each animal to prevent the spread of infection and to protect yourself. 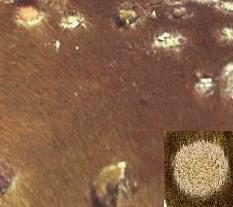 The photo above shows ringworm on a horse.